–11/22/63: Glad I’m Tackling with a Readalong! When 11/22/63 landed with a thud on my doorstep, I knew I was in for a hefty brick of a read. As I pulled the nearly one-pound beast out of the oversized shipping box … it loomed. At 842 pages, however, this book is more than 200 pages shorter than the last Stephen King novel I read, Under the Dome, which is 1072 pages. I decided to size them up together, and in this light, 11/22/63 does look much more manageable. Still, I find it most ironic that King took a jibe at the length of Donna Tartt’s The GoldFinch, which clocks in at a mere 784 pages. “Don’t drop it on your foot,” he joked at the end of his review for The New York Times Book Review (in which he mostly gushed with enthusiasm). I will keep that foot precaution in mind as I dig into 11/22/63 in anticipation of this Friday, Nov. 22nd, the 50th anniversary of that infamous date. Even better, I am reading this as part of the #112263Along organized by Kristin of My Little Heart Melodies, and I love seeing all the tweets and posts from other readers. The readalong goes for another month through Sunday 12/22 (did I mention it was a long book?) so please join us! Click here to sign up via Mr Linky! The group read runs until Dec 22. The midway point will be *the* date of the title, November 22, which this year is the 50th anniversary of the day JKF was shot (a pivitol plot point). We thought this would be a perfect timing to read 11/22/63, which has a time-travel angle. Though its not a horror story, it does seem fitting to start a Stephen King book in the run up to Halloween. 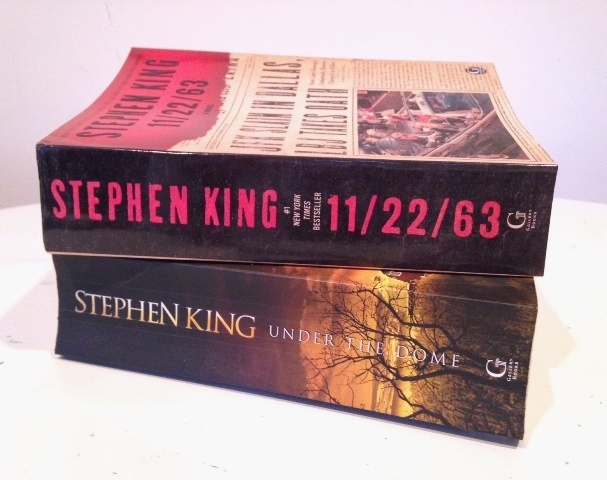 Inspired by Natalie at Coffee and a Book Chick‘s summer 2013 readalong of Stephen King’s Under the Dome, the DomeAlong, Sarah at Word Hits and I decided to take on King’s 11/22/63 this fall! Special thanks go to Natalie at Coffee and a Book Chick for the inspiration and Sarah for getting things started on the back end for this readalong. If you had the chance to change the course of history, would you? Would the consequences be what you hoped?